Description - The 461400 Windstream® Voltage Regulator is a “series” type regulator, which introduces a resistance between the generator and the battery as soon as the battery terminal voltage exceeds the preset level (regulation point). It is exclusive to Windstream Power and has been in continuous production since the late 1970's. We have sold over 10,000 of these over the years. Click here for the printable product page. Our Voltage Regulator is designed to regulate output voltage to protect 12V batteries or appliances in 12V direct DC applications. It will accept input voltages of up to 50 volts dc and will regulate the output voltage so as not to exceed 13.6V (± .5 VDC) and 5 amperes max. Available for 12V and 24V. (If you require voltage regulation for higher currents and voltage, we recommend this Charge Controller - The NC25A) which is typically used in battery charging applications where the excess voltage is diverted to another load. The type of voltage regulation circuit is a zener- regulated series Darlington transistor, in which excess power is dissipated as heat. In typical operation, once the battery is fully charged, the regulator serves to limit the maximum applied voltage. In this mode of operation even a high voltage drop at low current produces very little heat. Mounting: The 461400 voltage regulator is attached to a finned aluminum heat sink, which transfers the heat away from the regulator itself. It is essential that the unit must be mounted in such a way as to permit cooling airflow. The regulator is not weather proof. If the regulator is installed outdoors and is in an enclosure, be sure to allow for adequate ventilation or used forced convection such as a fan. It is recommended that the regulator’s heat sink fins be vertically aligned. Electrical connections – the input and output wires are connected to the two barrier strips on the top of the regulator case. Connect according to the polarity markings indicated on the case. The wires should preferably be terminated in crimp-on spade terminals, but if such terminals are not available, the wires, if stranded, should be twisted and tinned with solder, so that no wire strands can contact each other. The regulator case is not electrically connected and does not require grounding, but may be grounded if desired. Cautions – Heat dissipation - The regulator will get very hot if it is to be operated near its maximum ratings, or if there is a high voltage drop between input and output. Load- With no electrical load (open circuit), some generators are capable of exceeding 50 volts and in some applications, would permanently damage the regulator. The regulator should never be connected to a 120V AC outlet. Reverse Polarity – The correct polarity (positive to positive, negative to negative) must be observed or permanent damage to the circuit will result. Short circuits – If the output is short-circuited, and the output current exceeds the maximum specifications (5 amperes) for more that a few seconds, permanent damage to the circuit will result. Maximum current capacity is 5 amperes - the warranty on this product becomes void if excessive current or voltage is applied. 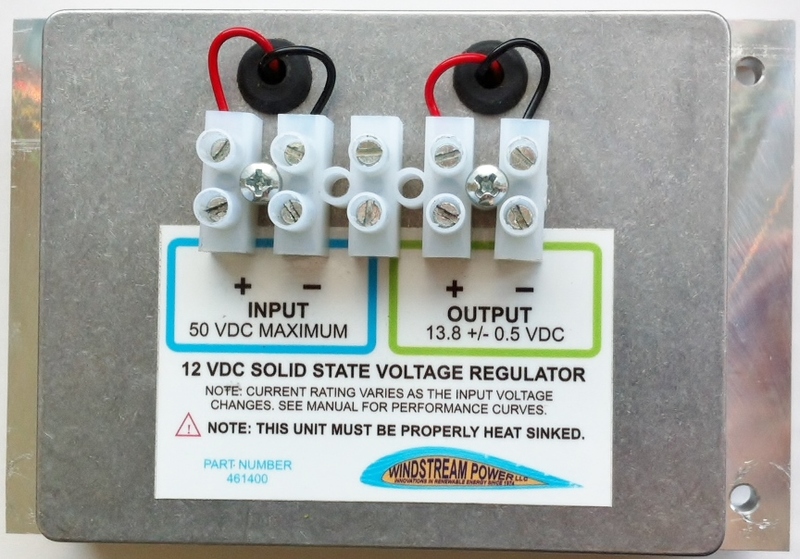 More information about how this Voltage Regulator works, in simple terms. In the case of a 12-volt battery, the float voltage is about 13.6 V. When the battery becomes fully charged, and draws no more current from the generator, the generator voltage would tend to rise above the battery voltage to whatever no load voltage corresponds to the rpm at which the generator is turning at the time. The main function of the Voltage Regulator is to prevent the overcharging of the battery after it becomes fully charged. 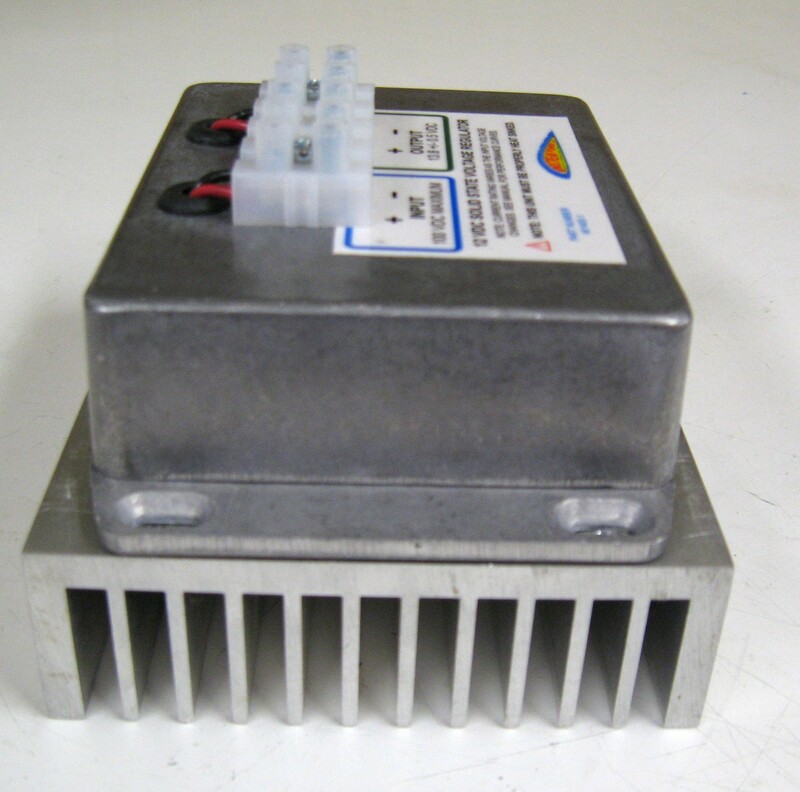 It is also used in direct 12V DC applications to prevent excess voltage from damaging 12V appliances. An Example: A 12V battery is discharged, down to 10 volts. As the generator starts turning, nothing will happen until the rpm and corresponding output voltage reaches the battery terminal voltage of 10 volts. No current can flow into the battery until the rpm of the generator is high enough to produce enough voltage to exceed the battery voltage before charging can take place. As soon as the generator voltage passes the battery voltage, current starts to flow into the battery. The faster the generator is turned, the more current flows into the battery, but its voltage stays the same, just over 10 volts to start with. Then, as the battery is charging, its terminal voltage gradually rises, as will the output voltage – which is when voltage regulation becomes critical to protect either the battery or the appliance. The generator voltage rises with the battery, as they are directly connected together, so their voltages cannot be different - but as soon as the battery becomes fully charged – about 13.6 terminal voltage for a 12V battery – it can no longer absorb any more energy, so the electrical load on the generator disappears. When that happens, if the generator continues to turn, its output voltage will rise to the no-load voltage for whatever rpm it is running at, which could well be 30-40 volts, which would cause damage if the voltage weren’t limited by the regulator. If you can monitor the battery voltage with a voltmeter, then you could simply disconnect the generator from the battery when it’s full. If you are not able to monitor the level of charge, a voltage regulator is a good thing to have. In the case of a DC direct application, regulation is essential to prevent over voltage and permanent damage to a 12VDC appliance.